So you’ve got a cute kid and everyone tells you they could be a model. Or you may have even been approached by a talent scout and think it could be fun for a bit. But before you go rushing off and getting headshots, you might want to have a good think about what you’re actually getting your child into by asking yourself these questions. 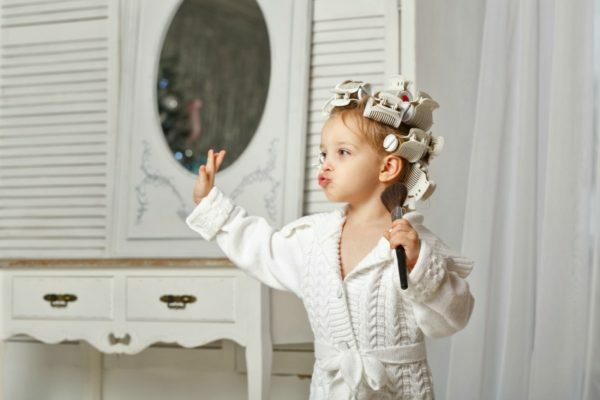 We know YOU think your child is the most beautiful/unique/cheeky looking cherub on the planet (and they very well could be), but do they actually look good on camera? This is the first thing you’ve got to ask yourself because there’s no point in taking your child through this process if they don’t take a good photo. Looking great in real life doesn’t always mean they’re photogenic. Do they enjoy having photos taken? Some kids adore being filmed or having their picture taken and will even smile on cue and play it up for the cameras. Others can’t stand it. Forcing your child into modelling is no fun for anyone – it’s distressing for them, challenging for you and they won’t get hired either if they look miserable or won’t stop crying. The same goes for parents trying to make their baby an Instagram star – if your child is sick of seeing a camera in their face all day long then don’t do it. Depending on the agency, sometimes parents are required to pay for professional headshots and portfolios of their child which are sent to casting directors. Of course if your child gets a lot of jobs then this is worth it, but in many cases it’s the cash cow of the agency with many parents talked into doing it under the guise that their child ‘has what it takes’ when the reality is that the industry is incredibly fickle and unpredictable, with a lot of competition. In order for your child to get chosen for a job you usually have to attend a LOT of castings, most of which they won’t get chosen for. And then if they do get selected, you may be required to drive to locations which are far away. So it can be very time consuming for both your child and you as their guardian/driver. If your child is a bit older they will need to miss preschool or school to attend shoots too as jobs are rarely on the weekends or during school holidays. As already mentioned, there are a lot of children out there vying for modelling jobs, so be prepared to sit at castings with pushy mums and dads who won’t speak to you or your child as you’re considered the competition. Also, if your child gets rejected from a casting, this could be upsetting for them so you need to be able to divert their attention away from the competitive nature of the industry. Are you prepared for ego? Many child models grow up to be well-adjusted kids. However, for a lot of them, it spells trouble because the attention is always on their looks with everyone from photographers and make-up artists to grandparents and strangers telling them how great they look. This can send the wrong message that appearances are incredibly important and create a little diva in the process, but the bigger worry is if their looks change as they grow and suddenly they’re not the cute kid getting hired anymore, which can be devastating for them emotionally. Do you realise it’s work? Sure you might get your child into this for a bit of fun for them and you, but at the end of the day, you are putting them to work. Modelling is a job that they are getting paid for and it’s not always child’s play. Sometimes kids are required to shoot for long hours, they might have to do specific poses which are tricky, miss their day-time nap, or be under strict instructions not to ruin their hairstyle or an expensive item of clothing they’re wearing. These things aren’t natural for kids to do. Of course, not all child modelling is bad, and in many cases can be likened to drama classes. So if your little one loves it and you’re able to ensure they’re not being objectified or mistreated in any way and it stays fun for them, then it could be worth a go. And by all means feel free to enter those cute baby photo competitions too (just remember your child’s photo will be out there on the web for good). Has your child done modelling? What was your experience like? Tell us on Facebook.